Going back to where it all started? Well here's an interesting find. Profesor Layton and the Curious Village seems like it's going to get an HD port to the Switch. This information comes from the G4F-Localization, which looks to handle various localization jobs for projects. The listing specifically mentions translation into Italian, German, and Spanish. This goes along with previous hints of Layton’s Mystery Journey: Katrielle and The Millionaires’ Conspiracy DX getting localized as well. Once again, this site makes mention of localization plans for the title, which would mark the second time we've seen indication of the Switch version leaving Japan. Would maybe consider rebuying these games if the price is right and the transition is handled well. 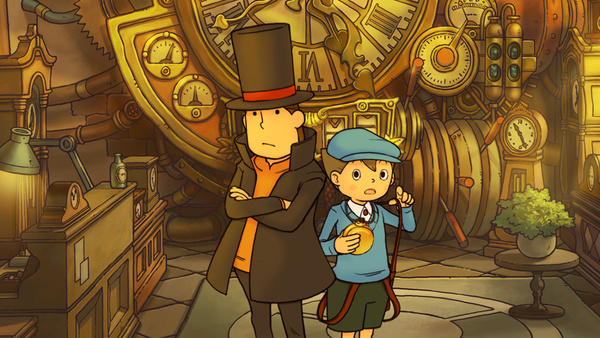 Obviously a new game would be preferable to me but the original trilogy is still arguably the apex of the series so I see the logic in porting those over for people who have never played Layton before. Also Layton 4 Smash come on do it!! I had heard a lot of good things about this game, so I played it nearly to the end not too long ago, and it just wasn&apos;t that good. The puzzles remind me of those riddles kids tell others that just make you feel dumb even if you get it right. "Gotcha riddles" Just hours of nothing but that. I was expecting it to be something as enjoyable as 999/VLR, but it was nothing like that. And it&apos;s such a shame too because there&apos;s so much to the series, and I was looking forward to spending a couple years playing them now and then. Yeah, some of the riddles are really stupid, but those are not that common in the rest of the games. I&apos;m absolutely down for this. I never played the original, but I did play through most of Miracle Mask on 3DS and really enjoyed it. Every bit of the Layton games could benefit from a higher resolution. All those nicely drawn environments were always begging for 1080p. Bought it on the DS, very good game, but I&apos;ve no interest or reason to play it again. Especially given how ports and what have you, have inflated price tags on Switch. There&apos;s no dual screen either, though that&apos;s not a big deal. And there&apos;s no touch screen while docked. If it was €10, I might consider buying it again. But I&apos;m not their target audience and fat chance it&apos;ll be that low. They could do it without the use of touch screen. Simply use the motion controls. But I&apos;m with you honestly. I already bought the trilogy as well as the prequels so there&apos;s no interest for me to get the HD ones especially if they are going to do the same thing with little changes. I&apos;m grateful an entire new audience gets to try these games. I only sampled them years back so this new version is a good start. I&apos;d pay around the same price as Phoenix Wright Trilogy. I don&apos;t see how anyone could complain about getting this series on Switch. Because it would mean that the game can only be played on Handheld mode? I have nothing against handheld but if you&apos;re blocking gamers way of playing games, that&apos;s bad.